Two months ago, the WSJ causally mentioned that Discovery Bay Games was developing a controller for the Atari’s Greatest Hits app on iPad. There was no other mention of this anywhere. Yesterday, Discovery Bay Games issued an official press release, saying that, yes, they are in fact developing the device in official partnership with Atari. Seattle – August 3, 2011 – Discovery Bay Games is pleased to announce it has partnered with Atari, a global creator, producer and publisher of interactive entertainment, to develop, manufacture and distribute a gaming accessory to work with Atari’s Greatest Hits App for iPad. Atari in the WSJ, Plus: New Atari Controller? Atari probably isn’t developing a new game console any time soon, but the article did mention that they’re working with Discovery Bay Games to make an iPad joystick-arcade accessory. At time of writing, we can’t find mention of this anywhere else online. It follows right on the heels of the iCade Arcade Cabinet, but with a smaller footprint and price tag ($30 to $70), and less retro design. Read the first few paragraphs of the WSJ article here (or the whole thing if you subscribe). Watch a video interview with the author, Yukari Kane, here. 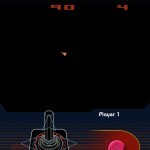 Techflash.com has given more details on the Atari iPad controller. It’s due out in the fall, 2011. Full story here. 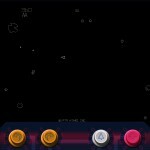 The iCade Arcade Cabinet has shipped, and Engadget.com has the review. 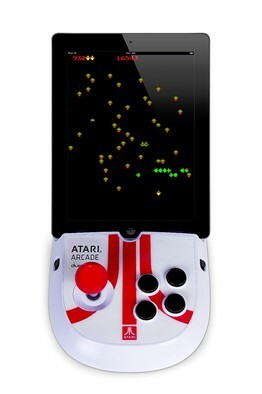 It pairs with your iPad 2 via bluetooth, and is designed to work with the Atari Classics app. Price: $100. Atari has just released Atari’s Greatest Hits for Apple mobile devices, with 100 classic Atari games: 18 arcade and 92 Atari 2600. The basic app is free and includes Pong. Games can be purchased in packs of 3-4 for $0.99, (there are 25 total), or you can get all of them for $14.99. A few truly great hits are missing (Pac-Man, Space Invaders, although these aren’t actually Atari games), but there are more than enough good ones that aren’t as readily available elsewhere. 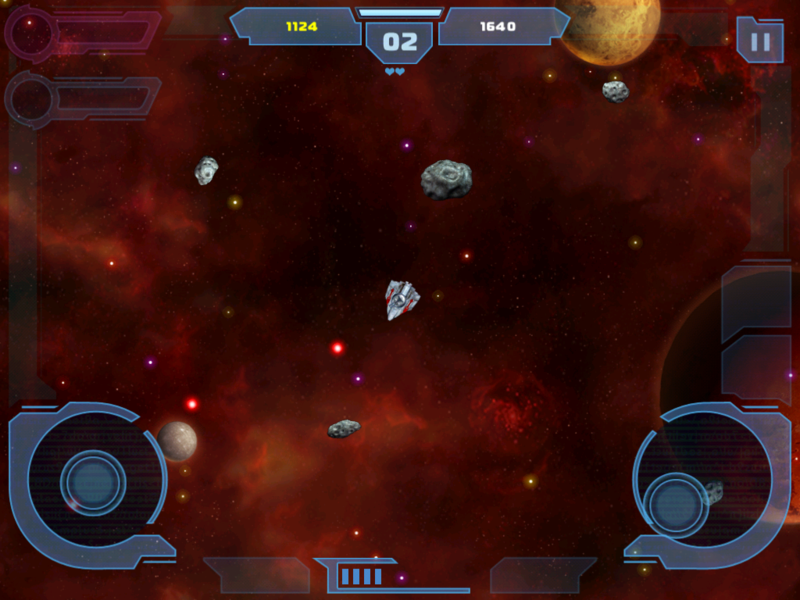 The “Asteroids Pack” includes Asteroids, Asteroids Deluxe, Asteroids 2600, and Canyon Bomber (Bluetooth Multiplayer). 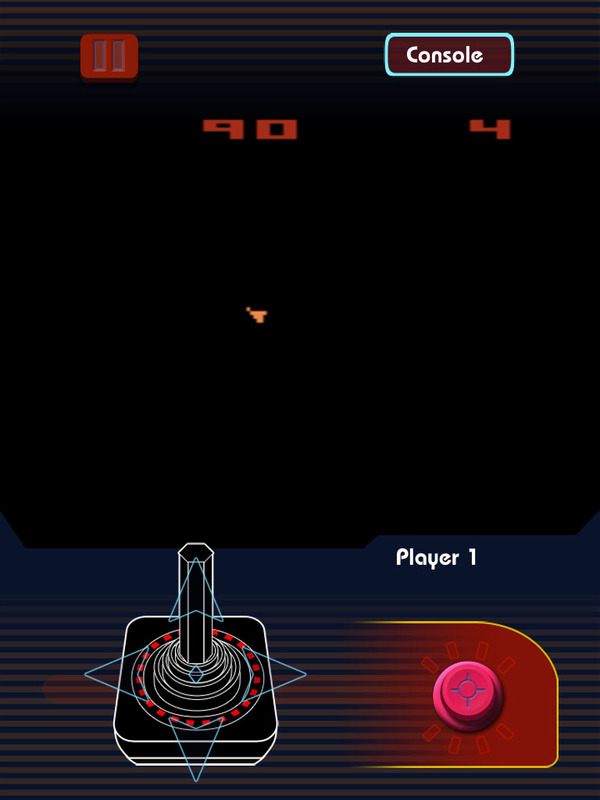 In the iPad app, the arcade version offers three control options: Disc, Roller and Arcade, with the controls in the border around the video window. In Disc mode, the device is held horizontally, with a left-thumb 360-degree disc area for direction and thrust, and right-thumb buttons for fire and hyperspace. Rotation is very responsive, but perhaps too responsive, and difficult to fine-tune without more practice. Roller mode has a left-thumb vertical roller for rotation (up-down equals rotate left-right), and the right-thumb controls thrust, fire and hyperspace. 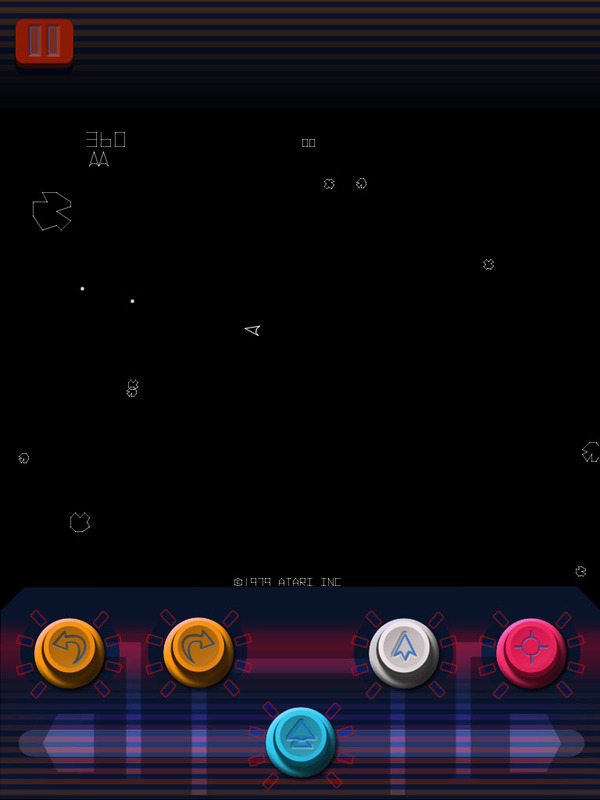 Arcade mode turns the iPad upright, with five buttons along the bottom in the standard arcade layout. It’s good, although when playing with thumbs, we prefer the roller. 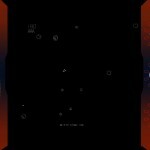 Supposedly this app has been developed along with ION, who will be releasing their bluetooth-connected iCADE iPad arcade cabinet in June. 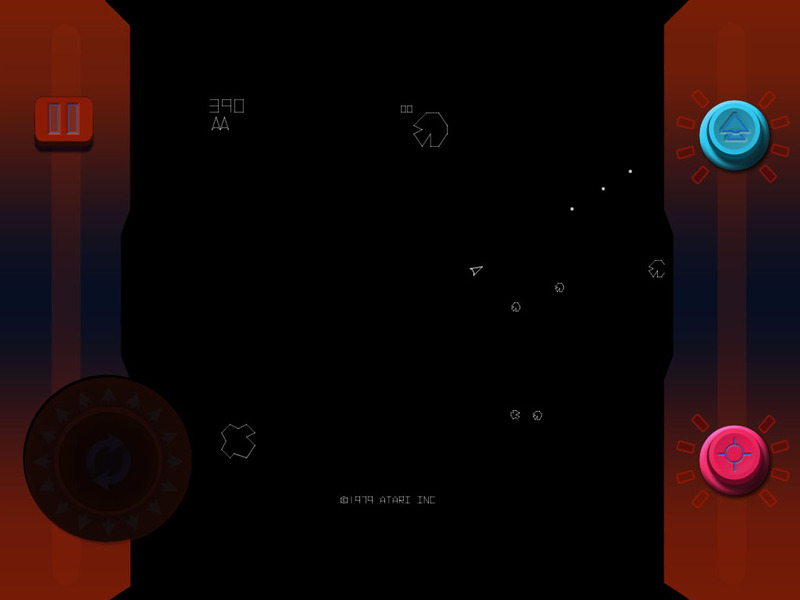 Currently, the Atari app can connect with other devices via bluetooth to play certain games head-to-head. With the iCADE, you place your iPad in the cabinet-looking holder and use the physical controls from there. It goes without saying that the graphics can’t be compared to a vector screen, but they’re true to the original code with slight modifications. 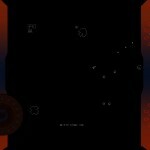 Specifically, when Asteroids is played on an LCD or CRT screen, the photon dot is almost too small to be seen. It glows brilliantly on a vector display, and the trace takes several seconds to disappear completely. But without creating some artificial effect, they’ve just increased the size of the dot so that it’s visible, along with the thickness of several lines. 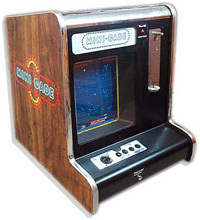 This is also the case with the online classic version at the Atari website, but missing with other authentic versions of the game, including the computer-based MAME. Game play feels about right, although just a hair faster than at the arcade. 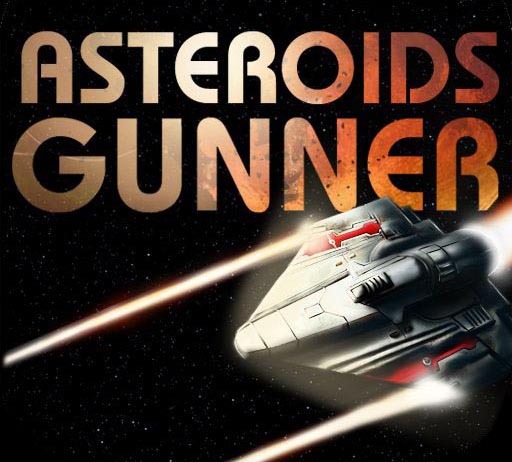 Speaking of other modern versions, Asteroids HD ($0.99) is an authentic replication of the game for iPad, with full-screen graphics and invisible control: slide your left thumb back and forth on the left side of the screen for rotation, tap on the right side of the screen to fire, and tap with two fingers to hyperspace. Works well. And while we haven’t tried the iPhone version of the new Atari app — and it may be great — the screen is almost certainly too small for the detail of the original. A favored variation that retains the feeling of line-art simplicity but adapts it to the small screen, is Spheroids [we couldn’t find a browser link for this game — this will link to iTunes]. 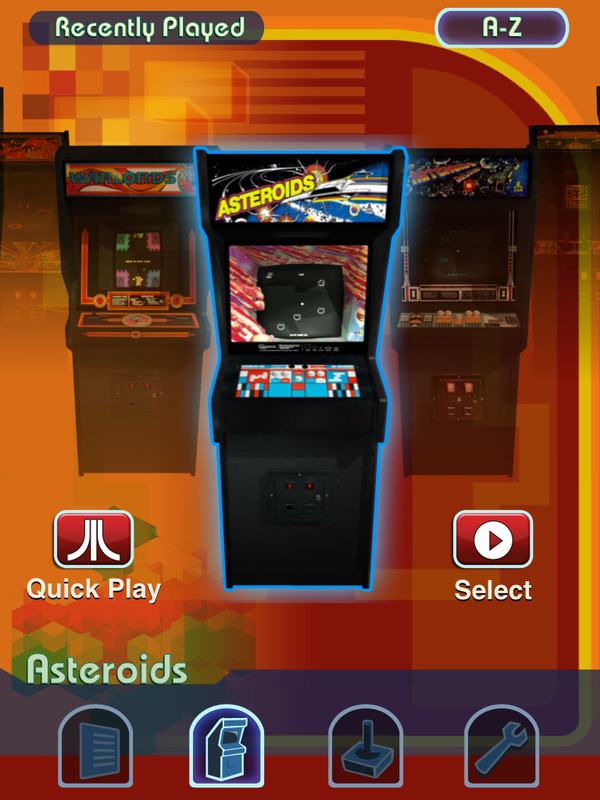 Back in the new Atari app, Asteroids Deluxe, is similarly authentic, with the faint background image found in the arcade. 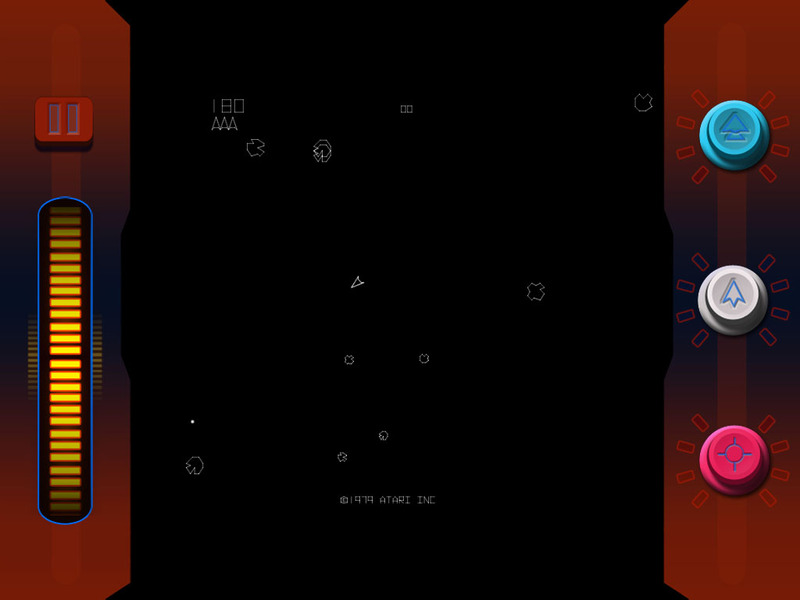 The Atari 2600 version of Asteroids has the standard game console options on load, and decent play with a virtual joystick and fire button. The graphics flicker like it would on a TV. The games also include a gallery of original package artwork and images, and all-in-all, it’s a dollar well spent. 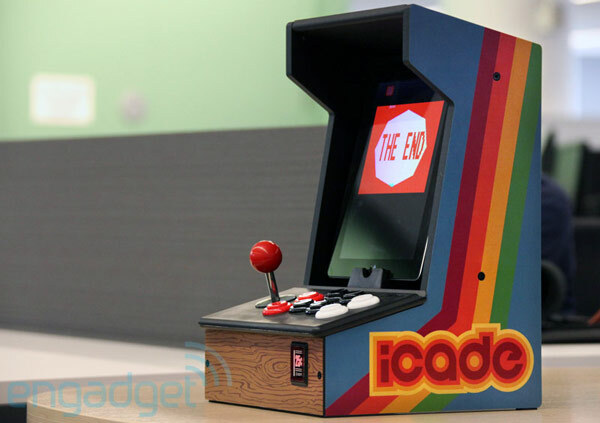 It’s been a year since ThinkGeek announced the iPad Arcade Cabinet — the iCADE — on April Fool’s Day. Since then, they’ve partnered with ION, and the product has become real. It’s a bluetooth controller and iPad stand in one, with arcade-style buttons and joystick. It’s expected to be available in early June, 2011. Pocket-lint.com has a list of other April Fool’s pranks that came true.